If you guys know me by now, you know that one of the biggest things I miss about living in Los Angeles is hosting parties at my house. So when it came time this year to plan Sunday's 3rd birthday party, I looked for a space that felt open and inviting like a home-- somewhere that gave me all the tools to host a great event, but where I could also use my special party planning touches to add that Elshane sparkle. I discovered that Kellogg's (yes, the iconic cereal brand) had just opened a concept shop in NYC that boasted wall to wall cereal dispensers, larger than life paintings of all of their famous characters (can I get a hello for Tony the Tiger, Snap Crackle Pop, and Toucan Sam?! ), cereal selfie walls, Pop Tart towers, Eggo waffle stations, wait... should I go on? I could be an all-star mom and go with Sunday's favorite characters like Shimmer and Shine, Frozen, Sunny Days... or I could be a hero mom and go with Sunday's favorite adornments like glitter, sparkles, pink and purple, unicorns, rainbows. Nah. I wanted something better. It had to go with the theme of the space, and what better theme for a cereal/breakfast bar than... A PAJAMA PARTY!! My first call was to my dessert guru, Amy Cakes and Sweet Treats in Los Angeles. I begged her to design my cookies and overnight them to me in NYC for my party. She designed the greatest "Sunday's Sleepover" creations. She asked me to send her photos of Sunday's favorite pajamas and sleeping stuffed animals so she could design cookies around them. I had her send me extra cookies which I "glued" to our cakes using buttercream frosting. I called on THE ONE AND ONLY expert party and stationery megahouse Minted to create personalized decor to scatter throughout the party. 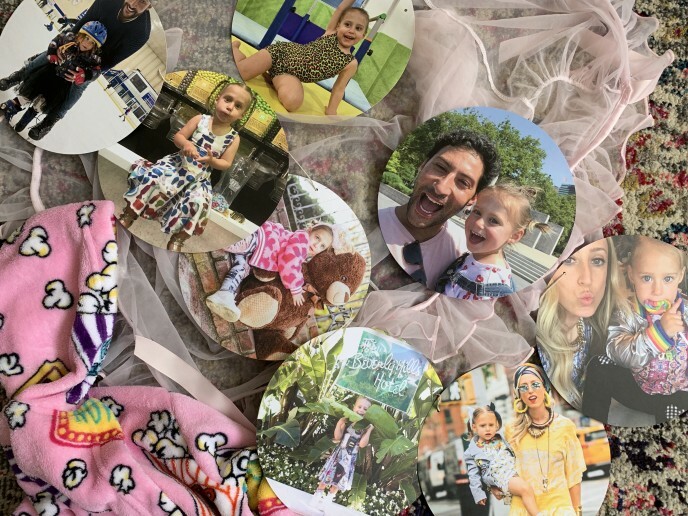 We designed endless custom banners with Sunday's adorable photo memories from her lifetime, so that the guests could say "Myyyyy, Sunday, look how you've grown!!" I designed quirky signs to hang throughout the space that said things like, "No Sleeping Allowed! ", "Wake Up! ", and "Eggos Have Vitamins!" We made custom thank you hang tags with Sunday's photo that draped beautifully on the special goodie bags. Our pajama looks were high on the list of importance! Silly me, mom of a three year old girl, didn't realize HOW upset Sunday would get when I told her we were having a "Sunday's Sleepover" party (and not a Frozen or Princess party like her friends). When I told her each time that she would be wearing pajamas to her birthday party, she would melt down in tears. Finally, I realized it just wasn't going to happen. I quickly used my styling skills and sourced a custom NIGHTGOWN (it's a dress, right!?) with a beautiful chiffon robe that felt oh-so-sleepy, yet oh-so-princess-y. Win, Win! Also, we used Petite n' Pretty body and hair glitter for her hair, and a Made with Love and Kisses fuzzy robe for added color and fun! For my look, I went silk pajamas with a designer handbag print from CJW, and custom eye masks made from Etsy. Entertainment and activities are key at birthday parties for every age. The second I penciled in what day I was having Sunday's party, I called Jam with Jamie to rock out with the kiddos! They brought ALL the fun-- a singing band with full instruments, a parachute, bubbles, puppets and more! They sang all the Disney hits and even a bunch of tunes that got the adults groovin' along. We had to literally drag the kids away from them when it was time to EAT PIZZA! They didn't want to leave the corner of fun! I also created an art table for the kiddos who wanted a more hands-on activity. My DIY of choice? Designing your own sleep masks, of course! Supplies were easy-- 50 solid colorful sleep masks from Amazon and one quick trip to Michaels to purchase a ton of felt stickers, glitter, ribbons, glue, and googily eyes! DIY PRO TIP: When creating a DIY station at a party, it's always a great idea to design a few examples prior to the party. Scatter the examples all around the table at the party so you can entice your guests to get their creative juices flowing! Plus this allows you to problem solve in advance if the materials you envisioned aren't working well with the project! Lastly, what party is complete without a face painting station?! The kids LOVE it. It's always a hit!! The goodie bags were important to me because I really wanted the kiddos to take home a piece of the Sunday's Sleepover theme. Luckily, when planning the party, I had just bought Sunday her first pair of Fuzzy Baba slippers, and thought to myself, "OK, every kid NEEDS these"! If you know how cute and cozy this brand is, you know it's a bedtime staple in any home! I added Piggy Paint (Sunday's favorite nail polish brand), a box of Pop Tarts, and a few other trinkets to complete the sleepover theme.